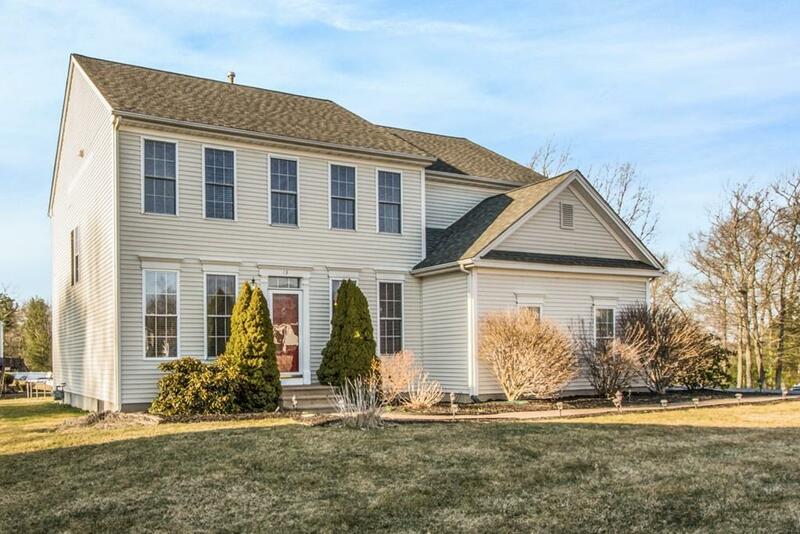 Nestled near the cul de sac in the desirable neighborhood of Oakmont Farms, sits this beautiful colonial! From the moment you walk in the door you are greeted by gleaming hardwood floors, beautiful custom crown molding, 9ft ceilings & wainscoting! The grand two story great room boasts a gas fireplace & floor to ceiling windows, allowing the natural light to pour throughout. The cabinet packed kitchen features granite counters, an island, pantry & a slider leading out to the deck, which overlooks the backyard! Newer stainless steel refrigerator, stove & microwave. Walk upstairs and you'll find a large master suite with cathedral ceilings & a master bath, complete with double sinks, a corner soaking tub, stand up shower and massive walk-in closet! Three more generous size bedrooms, full bath and laundry area complete the 2nd floor. New hardwood floors were recently added to the living room, great room and stairway! Open house Sunday 11:30-1pm.